We loved filming this fun wedding reception for Jeff & Teagen, following their wedding at the Cardston Alberta Temple! Their first dance as a couple was the most beautiful and magical we've seen!! This amazing wedding video of Jeffrey & Teagen was captured at the Cardston, Alberta Temple. Their wedding day was so much fun! 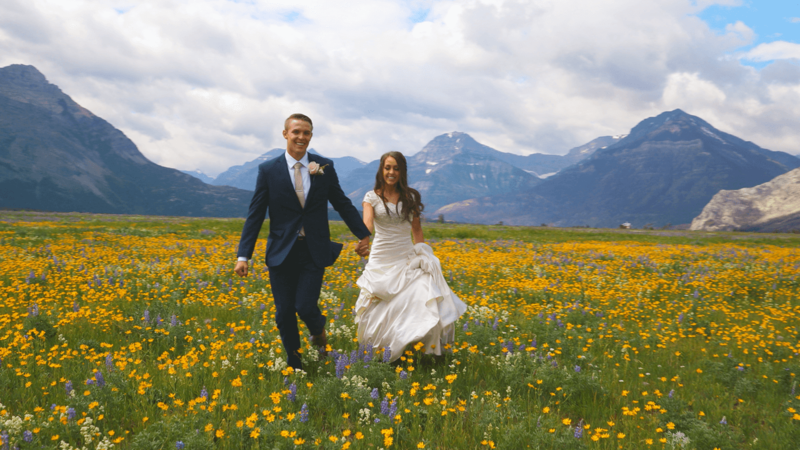 We were so thrilled to have the opportunity to film this First Look video for our friends Jeffrey & Teagen at the amazing Waterton National Park in Alberta, Canada. They are such a beautiful couple, and we had so much fun with them!! Edis & Lauren's wedding ceremony was so romantic! Be sure to watch the second video of their day - their wedding dinner and reception at the Castle Park Weddings & Events center in Lindon, Utah. This is the fun and romantic LDS Temple Wedding of Emily and Wyatt at the Salt Lake City Temple, in March 2018. Thanks, Emily and Wyatt, for letting us be a part of your exciting day! The Wedding Reception of Emily and Wyatt at the Heritage Gardens in Utah was such a fun and memorable day for everyone! We loved being part of it! Thank you to Edis & Lauren for being so fun and adventurous in the cold and the snow! It was our pleasure to capture their beautiful First-Look at the Castle Park Weddings & Events center in Lindon, Utah. Emily & Wyatt are such a fun and cute couple! It was our honor to have the opportunity to film their first look video! Congratulations Emily & Wyatt! It was a great to be in St. George for the wedding of the beautiful couple, Ian & Jasmine! We were honored to capture the special moments of their day! We had the wonderful opportunity to capture the wedding day of our friends, Robert & Kayla at the Salt Lake Temple, and their reception at The Old Dome Meeting Hall. They were so fun to work with! Ian & Jasmine's wedding day was beautiful from morning to night! It was so wonderful to capture and preserve these moments from their wedding reception for them! Wayne and Deann provided us with the utmost exceptional service. They were so easy to work with, they were professional and friendly. The video came out amazing. Our friends and family can't stop talking about it!! We absolutely loved our experience with the Dixons. Their cheerful attitudes, professionalism, fair pricing, and dedication made our wedding video an amazing memory that we will cherish forever! We are grateful they did that for us, and we recommend them to everyone! The Dixon's were seriously the best people to work with! Our videos turned out amazing and they had them back to us very quick. For the amount you pay you get very high quality work. Plus they are just super nice people! I can’t say enough about how great working with Dixon Pictures was. They were flexible and super responsive. I waited until the last minute to find a videographer ( I don’t recommend this ) but they were willing to fit me in and I can’t thank them enough. Now I have beautiful videos of all of my events. They did our First Look video, Ceremony and Reception. We were so pleased with how our videos turned out. Beautiful videos for my niece. They were stunning. They spent so much time with them and details. Couldn't have seen a more beautiful video. The Dixon’s drove to Canada for our wedding and we couldn’t be happier with the amazing footage that they gave us! They were so personable and kind and made us feel comfortable in front of all of the lenses. They captured all of the small moments and our favourite memories from our wedding day. They were so patient and were incredible to work with. Amazing videographers!! Your wedding day is going to be one of the most cherished days of your life - and you’ll want the memories from your day to last forever! We know how to capture ALL of the heartwarming moments of your beautiful day! Having two videographers allows each event and detail to be captured from different angles and perspectives, so nothing will be missed! Every happy moment, and the love you feel for each other will be immortalized for years to come! Compiling the video is the best part! Each frame of your video will be crafted with individual care - by both of us - to preserve all the details and emotion of your special occasion. When it makes us tear up, then we know you’ll want to watch your video over and over again! Let's Create An Amazing Wedding Video Together! Need a spectacular wedding video? Don’t hesitate to contact us, we would be excited to work with you and answer any questions you may have!! Either call, email us, or fill out this form. Please provide a description of your wedding, including the date, location, budget and other important details. Schedule early to reserve the date! Simply The Best For Your Special Day! Let's Work Together And Create A Video You Will Cherish For A Lifetime!